Get your practice moving – appointment check-in, dispensing and collections on-the-go. Ocuco’s iPad App engages your patients from the moment they enter your practice and throughout their patient journey. Boasting a seamless workflow, it supports your staff and frees them from working behind static PC or laptop workstations. Rather than queuing to be seen, your patients will be welcomed by staff as they check them in for their appointments. Your staff can continue to accompany patients, giving them a modern boutique experience as they browse your frame selection; advising them on the range of products on offer without having to return to their workstation to check stock and availability. Once a frame has been selected, scan the barcode and the patient’s spectacles can be dispensed directly from the iPad App with the option to take payment then or upon collection. Your patients will delight in the close personal attention and excellent customer service facilitated by the iPad Application. 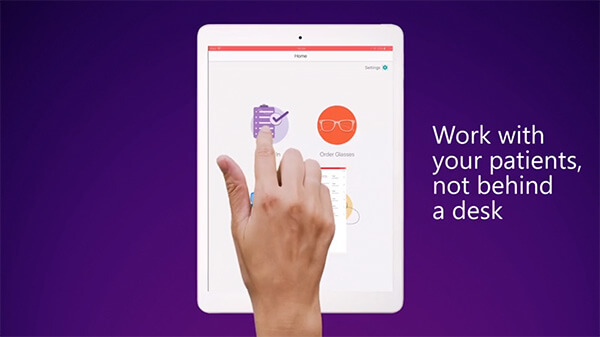 Maintain loyalty and differentiate your practice with the iPad App. The iPad App is suitable for use with the Acuitas and Focus 2 practice management systems.